Taken in the summer of 2016 the interesting photos in this post show Fat Albert, the Blue Angels’ C-130 cargo plane used for transporting crew and equipment to air shows around the country, undergoing a chemical de-paint process at Tinker Air Force Base (AFB) after severe corrosion which required non-routine maintenance repairs was found on it at an air show in Alaska. As told by Jillian Coleman, 72nd Air Base Wing Public Affairs in the article Fat Albert gets stripped at Tinker, the Oklahoma City Air Logistics Complex (OC-ALC) works on a fair share of C-130 aircraft, but seldom gets to work on one belonging to the Navy Blue Angels. 1st Lt. Willie Larkins, Maintenance Operations Officer in the 556th Aircraft Maintenance Squadron (AMXS), explained that the major corrosion was the reason the C-130 aircraft was pulled and brought to Tinker. David Painter, 566th AMXS, said there has not been a Blue Angels plane at Tinker in about four years. 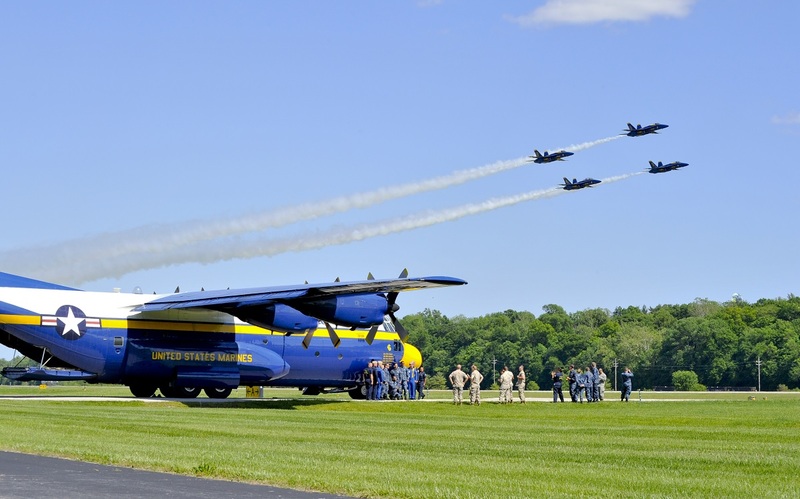 “Fat Albert is a very identifiable aircraft and does a lot of special things, so having it come to Tinker is really kind of a treat. This is a good time to let the world know that when they need an aircraft painted or de-painted, [Tinker] is the premier spot to go to. They want the best of the best working on these birds, so having [Fat Albert] brought to Tinker makes us feel privileged.” He pointed out. 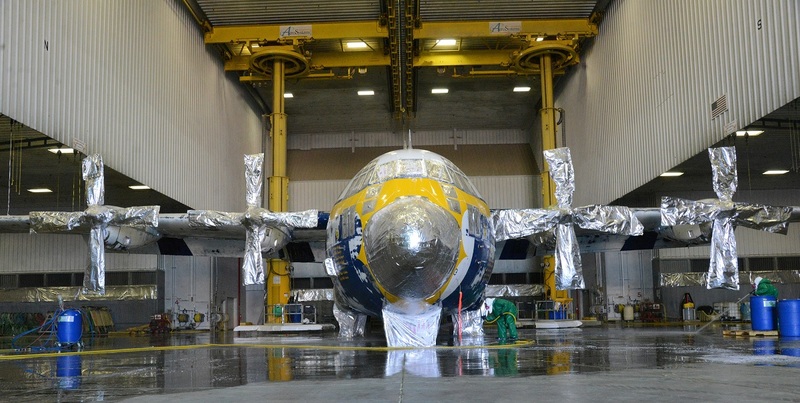 Fat Albert didn’t undergo full programmed depot maintenance at Tinker, but the OC-ALC was chosen as the pre-programmed depot maintenance (PDM) site because of its exceptional response time. A five-day process began late Aug. 12, once the aircraft was officially in the Air Force’s possession. The Navy was responsible for unloading equipment from the plane and palletizing it, as it arrived fully loaded with tool boxes and gear. The aircraft remained in the Navy’s possession until the procedural steps had been completed, Cathy Grizzle, master scheduler for E-3s in the 566th AMXS, explained. Once the Air Force took over, the C-130 was de-fueled. Fat Albert spent five days in the hangar, and maintainers conducted a full stripping of the paint. Then, the plane was re-fueled and prepared for pre-flight departure. Once Tinker completed their portion of the work, the Blue Angels were contacted to retrieve the aircraft. At the same time Tinker contacted Hill AFB, Utah, to coordinate movement to the next maintenance phase, said Ms. Grizzle. The Blue Angels operate on a strict and very structured schedule, so it was easier for schedulers to work with the Navy to ensure aircraft availability fit their needs. The Blue Angels gave Tinker about 30 days in total, but Mr. Painter said all-in-all, it only took about 15 days. Tinker’s ability to expedite the process through an environmental stripping agent gives them an edge over other bases across the U.S.. Using an environmental agent versus a non-environmental agent has shaved about three days off the process, Lieutenant Larkins clarified, making five days the standard timeline for de-painting at the OC-ALC. Ms. Grizzle explained that there were approximately 24 hours from the initial point of contact and getting everyone and everything properly coordinated. The Blue Angels contacted Ms. Grizzle, who then coordinated with the OC-ALC Paint Facility and Hill AFB. Slots within the paint facility had to be available in order to prepare an itinerary or timeline to the estimated completion date. Its next location had also to be contacted to confirm a retrieval and arrival date. Executing the schedules on time is critical, Ms. Grizzle said, and that gave Tinker the capacity to take action swiftly. Lieutenant Larkins said maintainers were very enthusiastic about working on this aircraft. Actually typical C-130s that are brought in are workload aircraft with a standard gray paint job. Having a specialty bird, especially a Navy aircraft, brought to Tinker is rather noteworthy. Fat Albert was forced to miss the rest of the season. 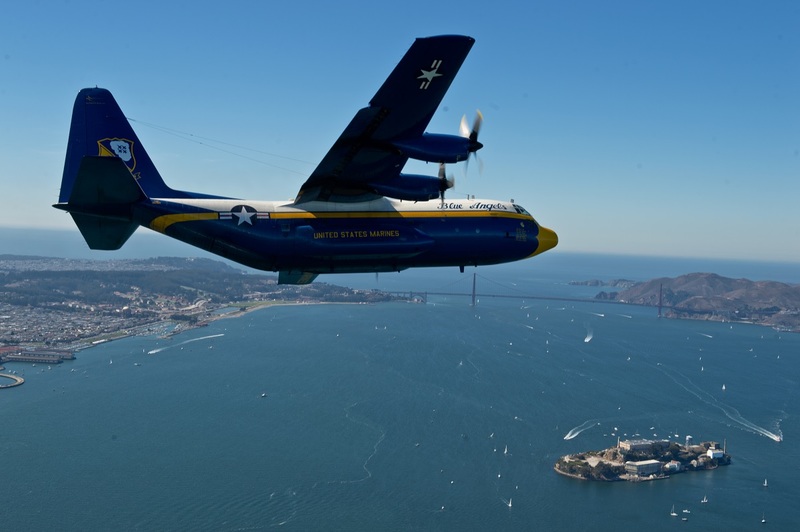 In the meantime, the Blue Angels flew a backup C-130 aircraft, “Ernie,” (which was a normal Marine Corps KC-130) until the PDM is finished. Fat Albert, a tactical transport aircraft flown by an all-Marine crew, usually travels 100,000 miles each season (mid-March until mid-November) and carries 45 maintenance and support personnel, in addition to any specialized equipment required for the upcoming air shows.